Music for music sake, probably, this is how you can describe this strong creative and talented duo. Without serious support of record companies, and funding from aside, those two guys managed to rock their albums and songs and reach significant heights with them. Despite the relatively modest according to international standards sales of debut The Language of My World album, long silence and addiction to OxyContin, Macklemore found the strength to return to the world music scene, and this time not alone. In 2008 he began cooperation with Ryan Lewis and formed this productive and creative duo, they presented the first unplanned mixtape called The Unplanned Mixtape, and then after testing the musical soil produced the first joint EP titled The VS. EP. The main topics they raise in their lyrics, usually touch issues of racism, drug addiction and consumerism. This social direction of the lyrics on the background of the boastful, disco tracks that most rap artists make, you at least can feel the sympathy for these two rebellious poets of our time. In 2010 after this album, they presented the next EP The VS. Redux, but the public wanted full, grand album. And after 2 years of expectations, October 9 2012 the guys got together and gather their forces and ideas to release their first studio album titled The Heist. LP start is given, and the first track on it is a song Ten Thousand Hours. The track begins with synthetic organ sound with smooth inclusion of Mr. Macklemore's rapping. Semantic meaning of the song comes to a discussion about what it means to be a creative person in our time, what privations, sufferings and obstacles stand in your way, and what it takes to really become something and someone in this life. Let's go further. And, of course, we cannot ignore the third track of the full length, called Thrift Shop, the fifth and final single of the album. This song made its way to the top of the Billboard Hot 100 in the U.S. and entirely conquered charts in Australia and New Zealand. Besides all this, it is this song for which musicians provided video. Meaning of the song? Well, this song is about hatred of consumerism and the constant pursuit for the brands. In this song, Macklemore expressly declares that he does not give a damn about all these brands and will gladly buy something in the thrift shop, and besides will take a couple of things just for "99 cents". A series of singles, hereinafter referred to as hits, make such tracks as Can't Hold Us, Wing$ and Same Love. All these tracks are easy to listen, they are fun and unrestrained, because that's the kind of atmosphere the guys do as general on the album, promoting the topics in the disguise of this atmosphere that are not funny at all. Boys stated their position clearly and specifically. One can hardly doubt their professionalism, it is definitely real, and that’s for sure. The album is completely circumspected in terms of structure, and regarding music processing, and concerning the semantic component. This is not surprising when you consider how much time it took to create The Heist. Guys prepared and presented to us very qualitative and developed product. And with such an independent orientation and acute social issues, they can be compared with their white colleague in this rap music shop - Eminem. Now we will wait and see how they continue their creative work, hoping that the next album is not far off. And one should surely listen to their album, because, in spite of the mass popularization of rap, there is a hope that some of the songs, as in previous dashing years, are created for underground, noncommercial listening as they are on The Heist. That people live their music, and not what is dictated by the changeable wind of popular musical tastes. And judging from the start, which took the guys and minimal advertising in the media, Macklemore and Ryan Lewis just focus primarily on the music and not on the money side. And it attracts, despite of the massive bombing with lyrics on the television, radio and Internet by other rap artists who want to sell their music in copies as many as possible, therewith, hoping that people would not pay much attention to the quality and the meaning of the given material. 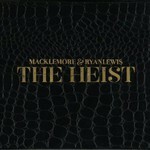 That is why we all should cherish such albums as The Heist and such musicians as Macklemore and Ryan Lewis.